AWTX ZM305 weight indicator is ideal for floor scales, batching, vessels and for in motion conveyors. The ZM305 GTN Inbound-Outbound model is ideal for use with Truck Scales and offers users the ability to store Gross, Tare and Net weights against up to 1000 vehicle IDs, providing inbound/outbound weighing. 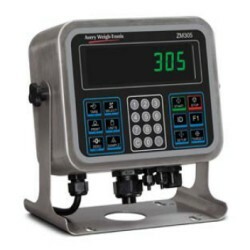 Avery Weigh-Tronix ZM305 weight indicator is ideal for floor scales, batching, vessels and for in motion conveyors. The ZM305 GTN Inbound-Outbound model is ideal for use with Truck Scales and offers users the ability to store Gross, Tare and Net weights against up to 1000 vehicle IDs, providing inbound/outbound weighing. The ZM305 Indicator is also very quick, sampling at 80 times per second, which is essential for accuracy when weighing in motion. It also features three standard set point outputs, and solutions for integration with peripherals for a wider system. The ZM305 can connect with up to 14 analog weight sensors and its higher excitation voltage makes it suitable for applications that require scale input from multiple weight sensors at a long distance. The ZM305, like all Avery Weigh-Tronix indicators, is designed and built to stand up to hard industrial environments. This indicator has an IP69K stainless steel enclosure providing ultimate protection in wet and dusty environments.